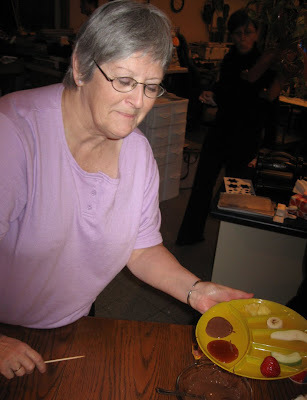 This week our hostess for Kraftin' Kimmies Challenge is the lovely Tara. This week, Tara is challenging us to use a tag on our card. I had visions of making a sentiment tag, but as you know, sometimes you can be rolling along with an idea and all of a sudden it does a 360! Lo and behold, what to do next? Well, I kink of liked how my punched and embossed tag act as a foundation for my hand cut and sponged arrow. The DP is from Basic Grey Eskimo kisses. 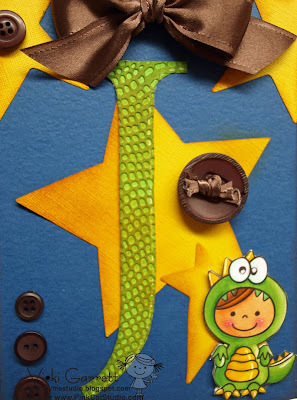 Cardstock is baby blue and ribbon~Olive Green. I sure love this sweet Maxwell image! He's going to be available for purchase on Sunday November 1st. I am really pleased with how the leaf turned out. Originally I had a green leaf, but here in canada, it would be rare to see anything but a turned leaf in my neck of the woods. Make sure you visit the DT today and show them some love! 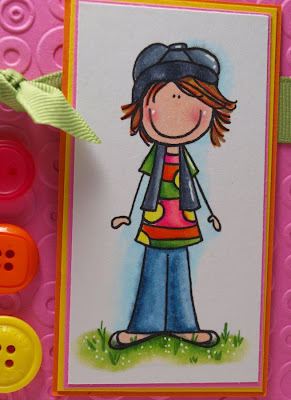 One lucky winner will be randomly chosen from the Challenge players and will win the stamp the Tara features on her blog today. Make sure you check the rest of the DT's Samples! They're Fabby! Crazy 4 Challenges Week 9- It's Very Scary! I have had a Fabulous time being the October Hostess. Thanks so much to Carol and Jim at Stampotique for sponsoring us this month! Stampotique Originals have the perfect stamps for Halloween. Daniel Torrente is the master of macabre and has created many sinister creatures to my delight! 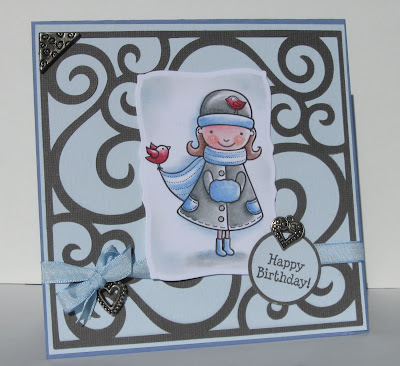 I used the new Basic Grey Eerie DP is a backdrop for this fabby Stampotique image. I coloured her in Copics. The Rub ons misc and the brad matches the BG Background paper. I've had a chance to see some of my stamping sisters' creations! 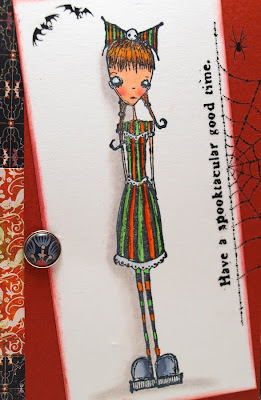 Head over to the Blog to see some Spectacularly Spooky creations, or alternatively you can get the links on my sidebar. Hope you'll play along and Happy Stamping! Lori Boyd Lollipops available at Stamping Bella Today!!! I am very excited to share some awesome news with you! 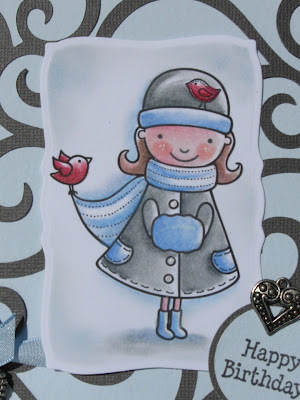 My good stamping friend, Lori Boyd is illustrating for Stamping Bella! Her new line of Lollipop Stamps are being released today!!! 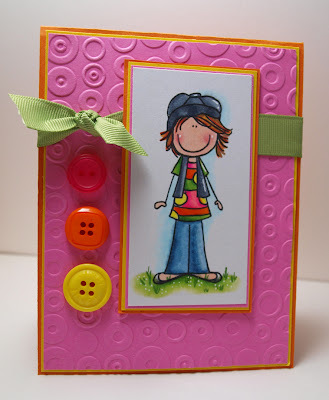 I have been blessed to know Lori through the Stamping Community and I have to tell you that her sweet Lollipop images are parallel to her personality. Although we have never met face to face, I've had the opportunity to chat with Lori on the phone and her warm and caring nature shines through. Lori created three images in my likeness a few months ago, but I hadn't gotten around to playing with them. The image you see today is not an image that is being released at Stamping Bella, however it's a wonderful example of her whimsical peeps and I encourage you to head on over to the Bella site to view these lovely Lollipops! I coloured Vicki with Copics and used a titch of white gel pen for highlighting! Cardstock is Primary Yellow, Bubblegum Pink and Orange. I ran the Orange Panel through the cuttlebug for added dimension and added a colourful buttons to complete the look. 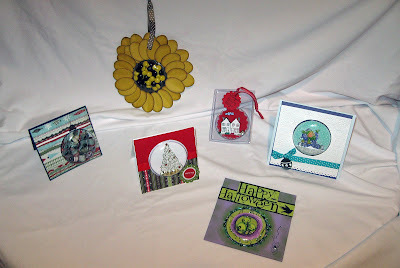 I discovered the awesome reasonable priced button bags at Stamping Bella and have accumulated several bags! I wish Lori and Emily much success with the Lollipop Line! 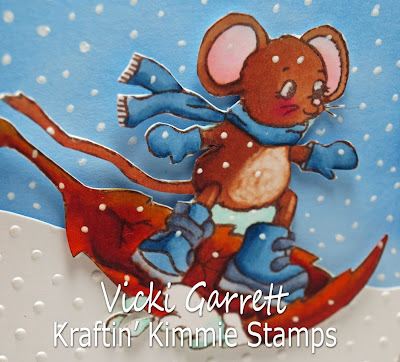 Kraftin' Kimmie's November Release Previews...Oh I LOVE Oliver! 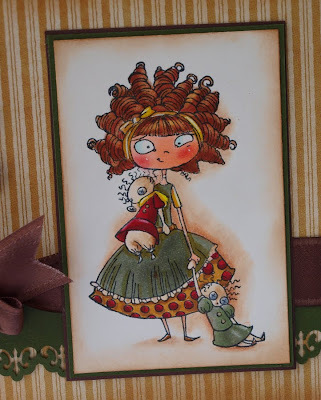 Sweet Sweet Sweet Oliver is one of the latest fabby stamps that Kimmie is releasing this Sunday, November 1st~! Oliver also comes with this awesome sentiment stamp! I was trying to get this card together fairly quickly, so there isn't the degree of depth that I would like with this image, I am thinking some more highlights might have been in order. I coloured Oliver with Copics. I used Chunky Glitter on his Hat which sparkles quite brilliantly in real life. The card base is a Primary Red and the DP is from Imaginisce. The brad is a little Crate Paper Bling Bling! The Super talented Michelle Boyer joins us this month with some incredible sneak peeks and of course you can see what the Krafty Girls have created for you by following the links on my sidebar!!!! These stamps are truly yummalicious!!!! 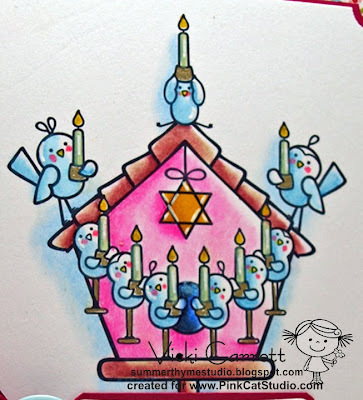 Bird Menorah is one of several Hannukah images being released at Pink Cat Digi Studio Today!!! In addition, there are also several sweet winter images, as pictured below. The colours in the Eskimo Kisses BG DP, matched up perfectly with the Prisma coloured image . Baby Blue and Rose Coloured Cardstock match up with the DP as well. Follow the links on my sidebar to see some fabulous samples! 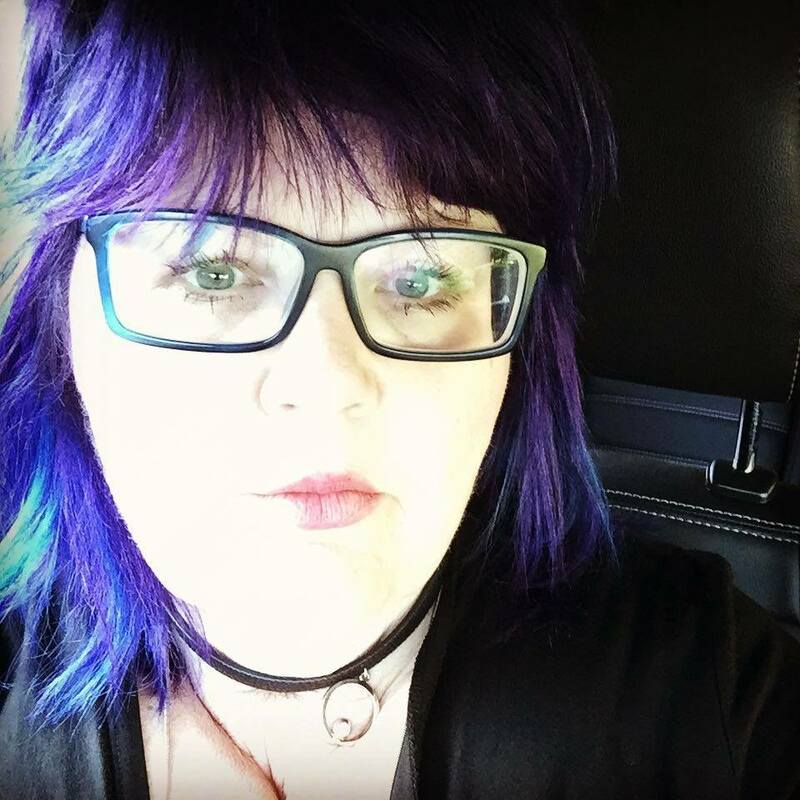 Mellisa started a fun contest today! She asked each Digi DT member to create a Betty that tells us a bit about herself. Can you figure out who created each Betty? If so then you could win some free digi stamps!! Then continue to do the same thing for each numbered image. The contest will end on Monday Nov. 2nd at 5 pm EST and the winners will be announced on the blog on Tuesday. The first person to get all 11 correct will be the main winner of the contest and she will receive 5 free digi stamps of her choice. A runner up winner will be chosen by random draw of everyone who enters the contest. So even if you don’t get them all correct you still have a chance to win a prize. The runner up will win 3 free digi stamps of her choice. Remember that you have to post your entry in the comments section of this blog post, please do not email it to me. Keep your eyes peeled, I'll have some more samples of this release in the next day or two! My Goodness time is flying by WAY too fast! Does anyone else feel like it was just yesterday that they were enjoying the Brilliant Summer Sunsets and the early Sunrise? This morning when I got up around 6 a.m. and sauntered outside to gauge the temperature, it was DARK!! ACKKKKK!!!! Christmas is going to be here before we know it!!! I've had a really really busy week. 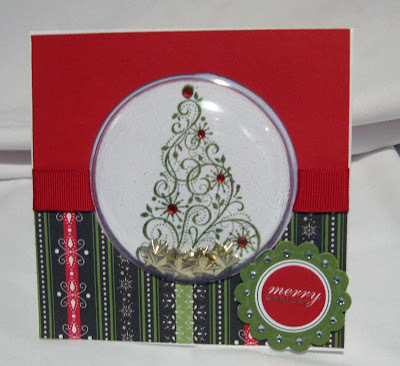 I'm teaching a Christmas Card class tonight and I've been prepping for a few days. I took a year long hiatus from teaching to focus on design, but I find that I miss having classes. I love to share what I've learned and to see the excited look on happy faces when they've learned something new, or accomplished a new technique with a level of ease! So I'm really really looking forward to this evening! 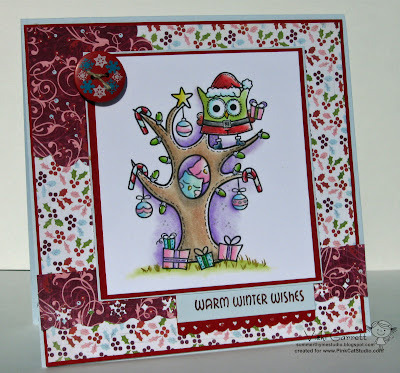 This week Kraftin' Kimmie's Stamps is hosting a colour challenge over at the Copics Colour Challenge Blog. Head on over there to get the Scoop! The colours for this week were R20, YG06 and E33. I didn't have R20, so I substituted for the closest colour I had in the Red family, R17. In addition, I used Eggshell for her Petticoat and eE51 as a flesh tone. What do you think of Piper? I love her Saucy little face and her Yummy Cup of Cocoa. Although I haven't used the stamp in this post, Piper comes with the cutest little inchie Cocoa cup! 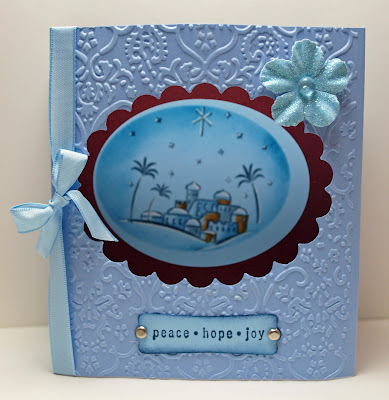 The Blue DP is from imaginisce, the Snowflake Pattern is the reverse side of this double sided paper. The sentiment is also a new release from Kimmie for November. 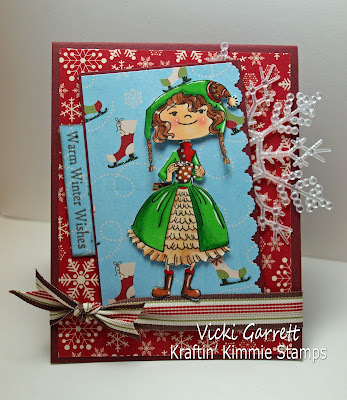 Official Sneak Peeks for Kraftin' Kimmie's November Release start tomorrow, but I'm sure if you take a peek at the Krafty Girls Blogs, you'll see some more new eye candy! I was very excited when I was contacted by Joycelyn of Totally Stampalicious about being a guest designer for their upcoming release. I had the wonderful opportunity to interact with Joycelyn through our involvement on another Design Team. I have been an admirer of her creations for some time and have even been lucky enough to see them in real life!!!! There is no catch and no further obligation to you! We just want to keep you updated with all the latest news that is happening at our store and on our blog! So what are you waiting for?!?!?! Click Here to subscribe today!!! Well, I had better get to bed.......if I go now, I can get 6 hours.......better than the just under two hours I got last night........See you soon with some Totally Stampalicious Peeks!!!! This will be our final challenge for this year! With Christmas coming, there is so much to do that we will take a break until next year. If you played along with all the challenges, you should have 40 cards complete! That's 40 more than I had finished this time last year! So i'm pretty happy. Thanks for playing along. 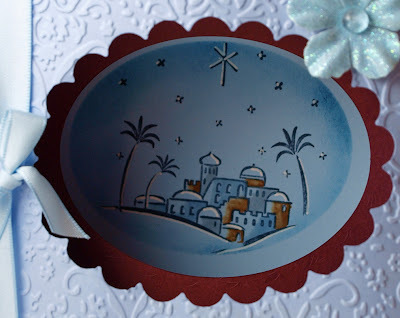 This weeks challenge is to create a Diorama card. You can find the directions HERE on splitcoaststampers. My good friend Diana Gibbs authored this Tutorial. It looks quite complicated, but really is very simple. The only difference in my card is that I used nestie's to punch my centres and I cut my cardstock to 5" high rather than 3". The Cardstock I used is baby blue, pale lilac and burgandy. The stampset is retired and is called City of David ( I think.....lol....oh here I go again!). I ran the front panel through the cuttle bug for dimension. 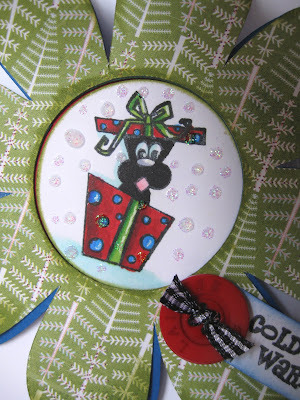 Don't forget to hop on over to the CSAYL Blog to check out the Dynamite creations!!! I'm very excited to be Krafty Kimmie's Hostess with the Mostess this week!!! The Challenge? 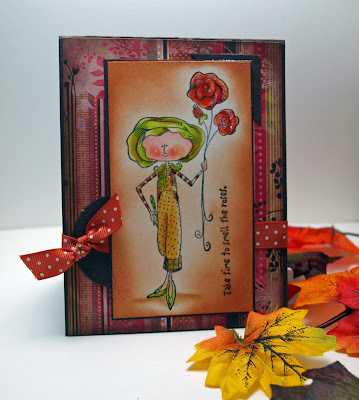 To create a card using an Autumn Pallette: Rust, Brown, Green and/or Yellow. Charlotte was coloured with Copic Markers, The DP is from Graphic 45 Card Base is Chocolate and Artichoke. Fleur de Lis punch is from EK Success, buttone misc. Now if you join our challenge, be sure to link us up in the comments section of Kimmie's Blog! And if you post your design to an online gallery, such as Splitcoast, be sure to use the keyword KKSC3, so we can all check 'em out!! 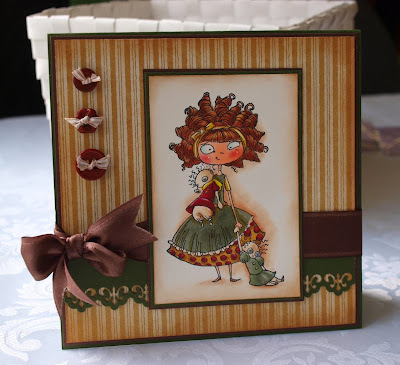 If you enter this week's colour challenge, you could be the random winner of....Charlotte, which is featured on my card!! 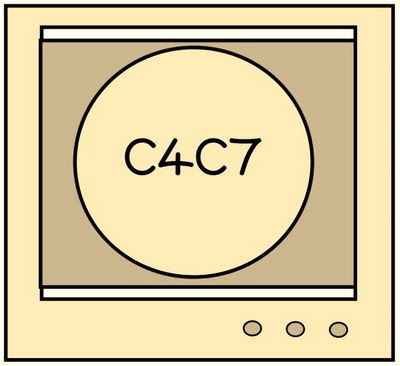 If you would like to play along all you have to do is create a challenge card and upload it to your blog and/or to your SCS Gallery using the keyword C4C7. Don't forget to go back to the Crazy 4 Challenges Blog and link it on Mr. Linky so that everyone else can see your card too. Check my sidebar for the links to my DT friends and go and show them some love today! 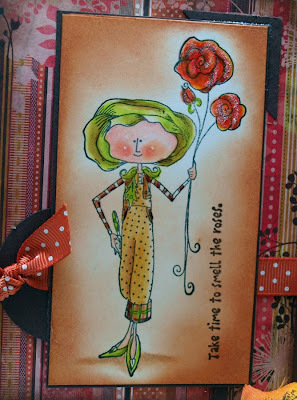 Cabbage Rose is a sweet image from Stampotique. Artist Janet Klein has also designed the perfect sentiment to go along with the image. Rose is coloured with Copics, edges sponged with Caramel Ink. DP is from Basic Grey's Indian Summer Collection. If you want to see some Beautiful Rich Paper, this is it! Rust Ribbon and a Chocolate Cardstock Base completes the image! More Pink Cat! Hoot Hoot!!!! Here's another sample of the new Digi Images available at Pink Cat Digi Studio this week! 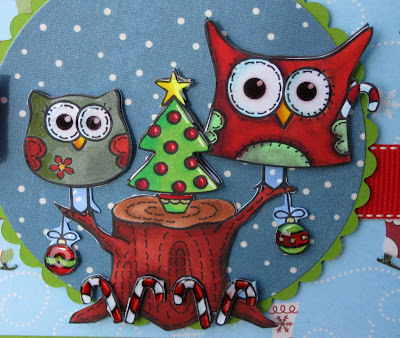 Sweet Santa Owl is bringing presents to the sleeping babies!!! Oh my gosh, I Love love love this image too!!! I coloured the image with Prisma Pencils and blended with Gamsol. 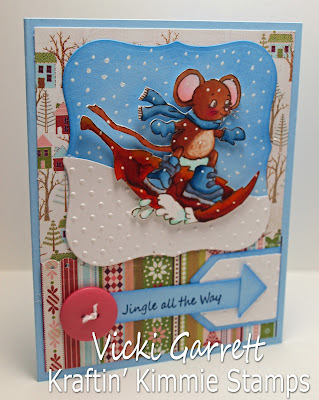 The DP is the new Christmas Basic Grey, Button from Fancy Pants! Pink Cat Thursday! More fabby new images and a contest! Here' s little Lily in her Winter Coat, one of three fabby images being release today at Pink Cat Studio Digi Store. Melissa has outdone herself again! To make this card, I coloured Lily in with Prisma Pencils and blended with Gamsol. 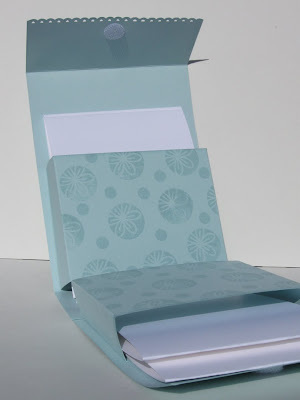 Base Cardstock is Prism Nautical Blue Light and Bazzil Grey. The scrolly mat was cut with my Cricut Storybook Cartridge! 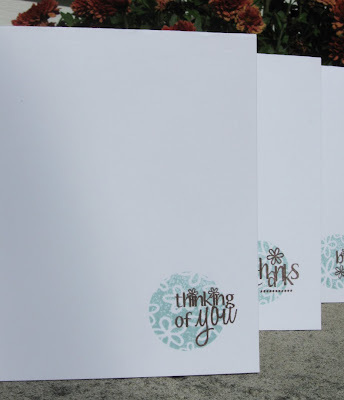 Would you like to try digital stamping for free? 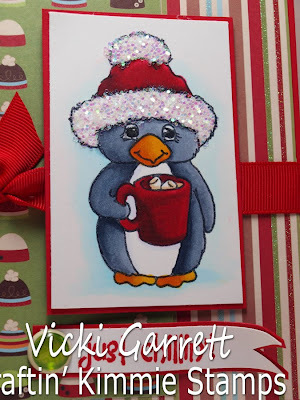 Melissa has created an informative tutorial to show you how easy it is to download and print digital stamps. 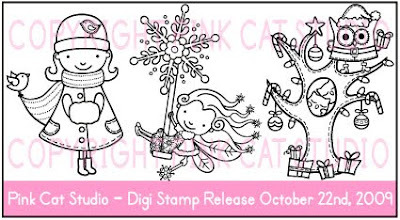 In the tutorial there is a free digi stamp that you can download and try out. In addition, Melissa is running a very very cool Digi Ideas Contest. Want to know how to win a free Digi Image? 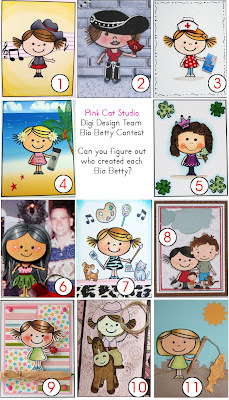 To enter the contest, leave a comment the post on the Pink Cat Studio Blog and suggest an idea for a new digi stamp. 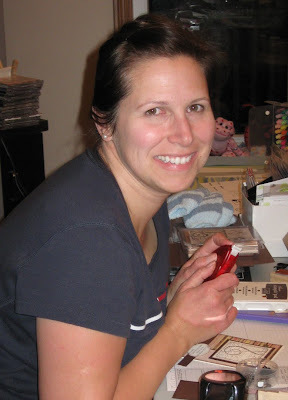 Each week Melissa will select an idea and turn it into a digi stamp. 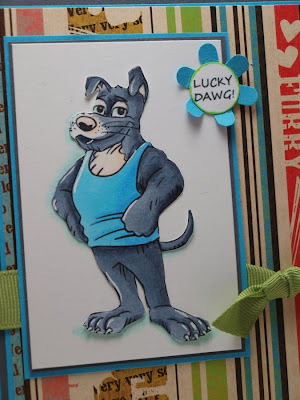 The person who made the suggestion will receive the new digi for free in advance of the release and will be invited to create a card with it to be displayed on this blog during the new release. How cool is THAT??? So put those thinking caps on peeps and share your ideas! Don't forget to link off my sidebar to see the Digi DT's wonderful creations! Lily in her Winter Coat, Snowflake Fairy Lily, Santa Owl in Xmas Tree. Stay tuned for another peek tomorrow! This is a quick and easy Project I completed at Jactopia this weekend. 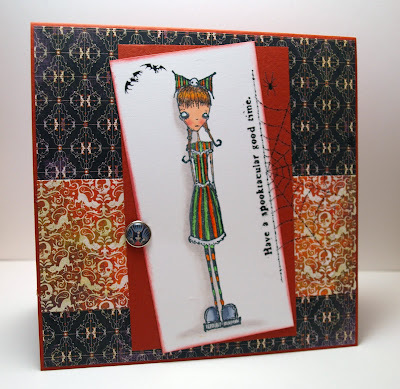 I plan to do a tutorial for this project and place it in The Stamps of Life Freebie Projects . 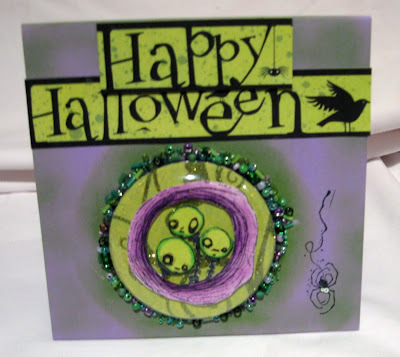 You can see a few neat tutorials in there, including one for the Paper Pieced Pumpkin card that I showed you last week. Check the site often for new ideas! 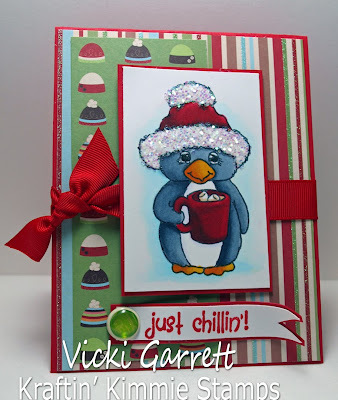 For the inside and the box top, I stamped tone on tone with a Robins Egg Blue Ink, to create a watermarked look. 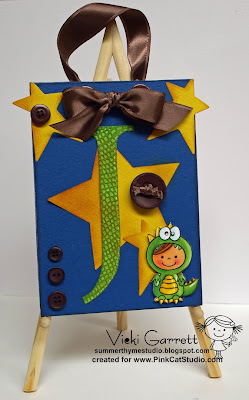 To do the front panel on the box, I was inspired by a card by Kristin9312 in the Stamps of Life Gallery. Thanks Kristin! The masking technique was used on parts of the panel. 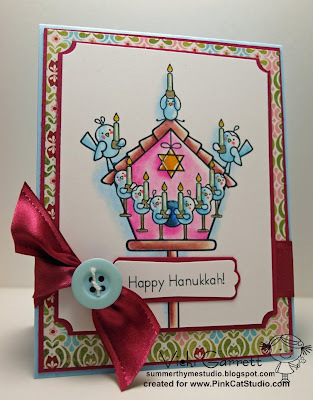 The simple cards were inspired by this card by my good friend Jeanne Streiff. 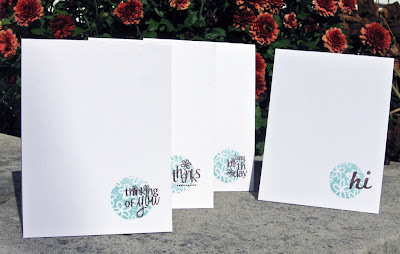 I wanted to keep the cards as simple notes and was thinking that this would be a very quick and easy gift project! What a Blast! This is our 5th or 6th Jactopia......our once a year Girlz weekend hosted by my BFF Jacqui! I look forward to this event every October. I was a little worried this year as my Dad is scheduled for some knee surgery this month and there was a little concern that it would be this past weekend. Fortunately, he will have his surgery on the 27th of October, which is kind of a bummer because it's my parents 47th Anniversary, but in jest he indicated that he would save on a dinner out this year! 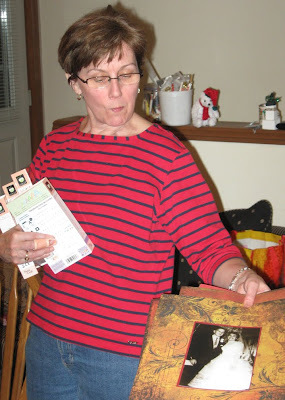 This is Jacqui's Mom Linda! Diana, we were missing you this year and I was kind of hoping that you'd surprise us again! Kim Showing off the beginnings of a Fabby Layout~! 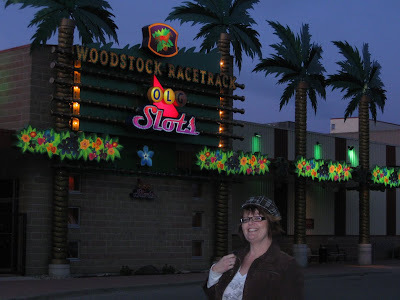 We took a little break to test our luck at the Woodstock Casino..........I think it took a hot 9 minutes for each of us to lose our $20.00 and then head back home for a super dinner of Jacqui's specialty, baked spaghetti!!!! Yummo! 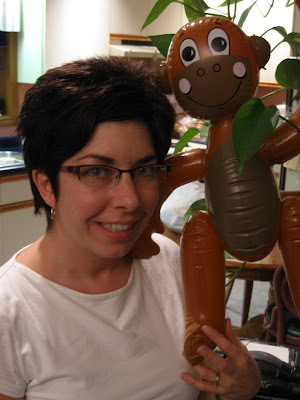 ere's Tami (the Tamster) and our Sweet Monkey Mascot! Donna is so creative........just don't try to take her tape! Yes, can't say the eating was very health wise this weekend. 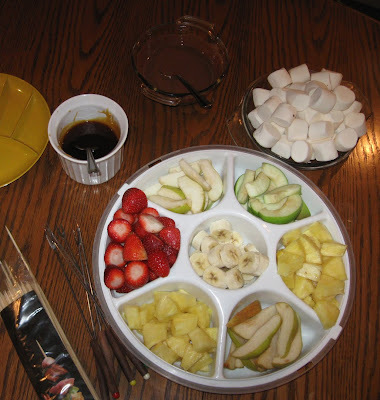 I planned on being focused and buying fruit to snack on.......problem is that we found a Yummy Cadbury Crunchie Fondue Kit in Walmart and I was way too tempted! Have to tell you, it was quick, easy and delicious.......despite what the directions say, DO NOT put the packets directly into the Microwave........snap, crackle POP! hehe!!!! Apart from the Marshmallow, the Pineapple was the best!!! Look at what we all came up with! 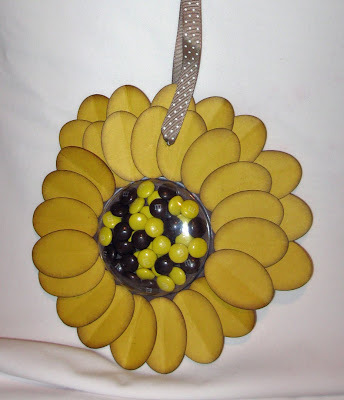 Tami's Sweet Sunflower.............Those M&M's wouldn't last long in my house! This is my Snow Shaker Card. 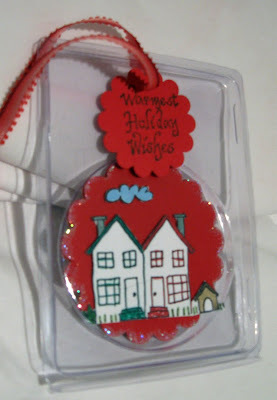 The image is from Mo's Digital Pencil..........I tried to use some glitter inside the plastic, but the static made a big mess, so I snagged some clear Micro Beads from Jax which was much more effective!!! I am So blessed to have such good friends in my life. People will come and go from your life for different reasons, friendships will be tested, sometimes falter and over time, you discover who your real friends are. These ladies are precious to me and I wish that there wasn't such a geographical distance between us. We'll all meet at my place in April for Victopia, but I sure hope that there will be at least one road trip east or west before then. Thanks for making my weekend wonderful girls! I cut the Flower Tag from my Cricut Tags and More Cartridge in a Brilliant Blue Cardstock. The top layer is from the Eskimo Kisses Collection from Basic Grey. I coloured the cute Puppy with Copics, highlighting with Gel Pen and adding Stickles for some glitz! 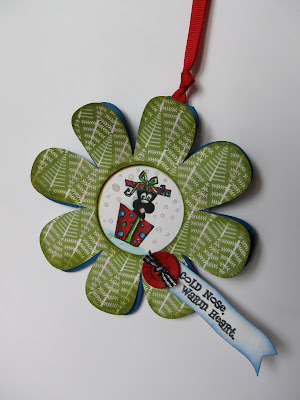 A Red Button and Ribbon add a little extra zip to the green and blue backgrounds! Hope you'll play along with us and check out the CSAYL Blog to see what we all have been up to! Here's a little Project that I created for my Cousin Nikki's Baby Jensen! I couldn't resist when I saw this sweet image from Pink Cat Studio Digital Store. I have had some 5x7 canvas sitting around in my "collection" cupboard.........well actually it's more like Fibber McGees Closet........everytime I open it up, it means clean up because it's just Way to full.............so I am going to try to challenge myself to make it managable by actually using some of the "stuff" in it! This was an easy peasy project! I cut some card stock at 5x7 and using some sticky adhesive, coloured the canvas. I used some Dark Brown Pigment ink around the edge to soften them down. 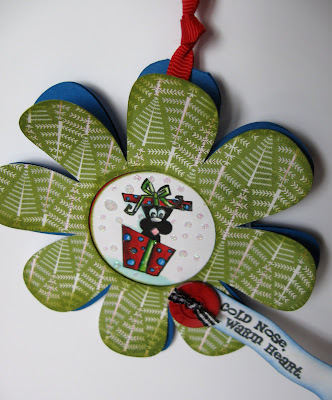 The Stars were cut with Sizzix Dies and Inked with that Dark Brown Ink. Chocolate Ribbons and Buttons add a nice complimentary colour. The Large initial J is stamped, cut out and embossed with a cuttlebug folder. Itty Bitty Bobby is coloured with Copics, highlighted with White Gel Pen, cut out and mounted on dimensionals. Holes were punched in the top of the Canvas with a Cropadile. Honestly, I think I had this project completed in just over a half an hour! I absolutely LOVED this past Digi Release and you will absolutely see more projects created with these cute cute images! 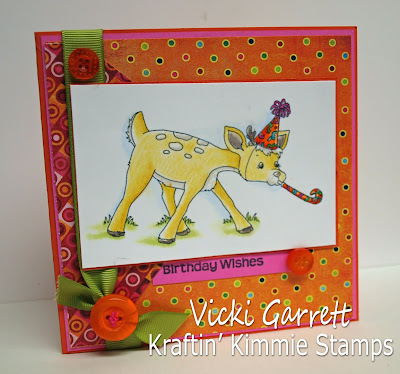 Jeanne Streiff is our Hostess for this weeks Kraftin' Kimmie Stamps Challenge! Your challenge this week is to use Buttons on your card.....button, button, who's got buttons?? I have buttons to BLIND YOU! I can't get enough.........buttons and ribbons seem to be my thing!!! lol! Want to play along? 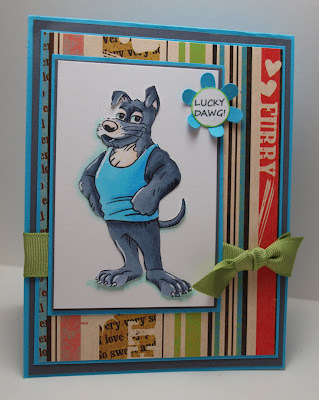 Visit Kraftin' Kimmie's Blog for all the specifics and to link your challenge card. One Random Winner will win some Sweet Candy! A Posy Stamp! 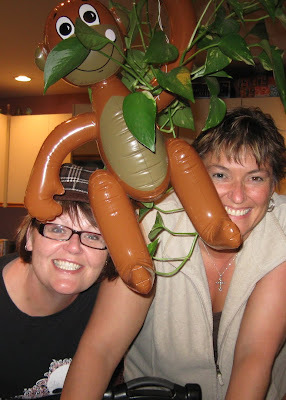 In addition to linking over to the Krafty Girls Sites to see some yummy samples, we have two super talented Krafty Guests this week: Michelle and Katy . So what do you think of Dorothy the Party Deer??? Coloured in Prisma Pencils, she is the life of the party! The DP is from Basic Grey.........Lime Ricky, I think, but don't quote me! lol.... I am terrible at remembering to make notes when I'm creating! Base colours are Hot Pink and Bright Orange. Orange Buttons and Olive Ribbon to finish! Although I am October Hostess for our fabby Challenge Group, I was kindly rescued by Cindy Haffner, who designed this awesome sketch for me! Thanks a bunch Cindy! If you would like to play, we would love to see you share your creation here. Please upload your creation to your blog/gallery using the keyword C4C7 and go to the Crazy4 Challenges Blog to add it to Mr. Linky so we can all access it. 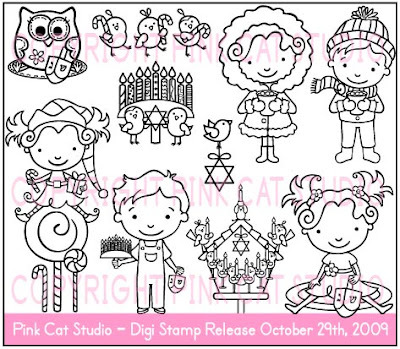 This image was just released yesterday at Pink Cat Studio Digi Stamps . Hootie and Squirt are happy on their Stump Perch! I coloured this image with Copics and cute three layers of images to add a lot of dimension to this card. 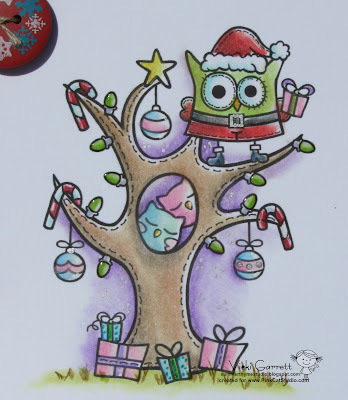 White Gel Pen adds some accents and Diamond Glaze gives the owlie's glassy eyes! The Dotted DP is from Graphic 45 (yep, I'm sure today!) , the lighter blue paper from Imaginisce and sponged on the edges with Dark Teal Pigment ink. Buttons are from Micheals. 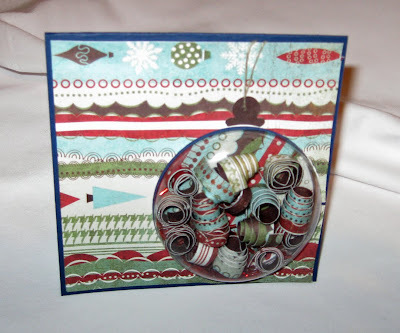 I threaded a thin strip of coordination cardstock through the buttons for a different look! Here is a copy of the Sketch if you'd like to play along! Having a fabulous weekend with my Girlfriends at Jactopia!!! I hope that I'll be really creative and have lots to show you next week! 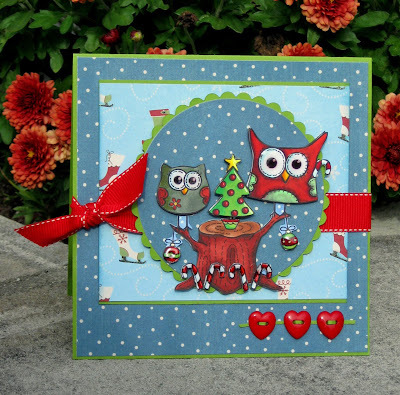 PInk Cat Digi Studio Release-What a HOOT!!!! Kraftin' Kimmie Challenge #1 It's Birthday Party! Kraftin' Kimmies Release Day Blog Hop~! Introducing Lillith! A Kraftin' Kimmie Sneak!